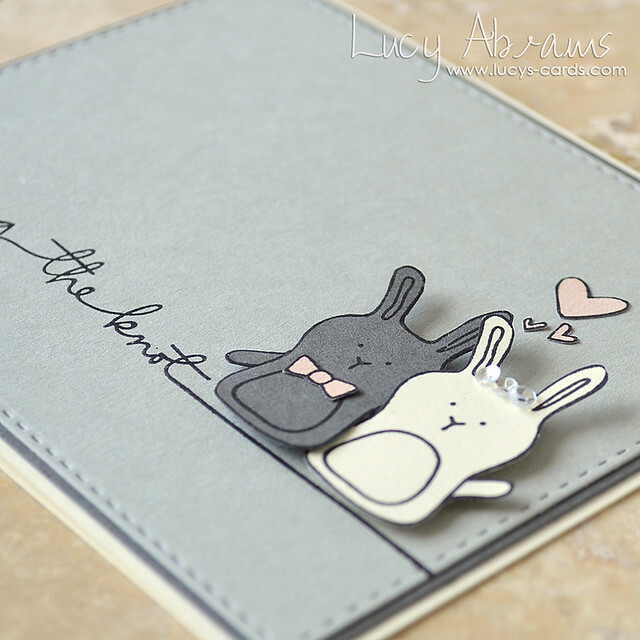 Today I have a card to share that I created with elements from the May Simon Says Stamp Card Kit, and the cute bunny stamps from their Baby Party Animals stamp set. I wanted to create a not-too-girly card, so went with a grey and ivory colour palette with just a touch of peachy pink for the groom's bow-tie (which I got from Hero Arts Baby Animals set) and some hearts. All the cardstock is included in the May card kit - love the way everything is so coordinated in these kits. For a bit of bling, I created a Moonshine sequin tiara for my bunny bride. Oh my! One of the cutest wedding cards EVER! How many ways can you say adorable? How about A-DOR-ABLE! Lucy I love it... in fact I used this same color combo for the anniversary card I made for my husband... tune into Muse next week? Thanks! Super cute! Love how you used this stamp set for a different purpose.